A few weeks ago I met a lovely woman at my new favourite mother-meeting spot – Winslow’s Home, which seems to be a great place to bump into other people who like homely little stores and coffee with their babies. It was a lovely sunny day, so we were all sitting outside, I was entertaining Kazuo and attempting to make a little more progress on the only thing I have managed to knit him this year. She had an inquisitive two-year old who wanted to see the baby… and so we got chatting about our fledgling knitting skills. I started really knitting last year after several not terribly successful forays earlier in my life, including the time Dianna helped me rather disastrously adapt a cardy pattern for myself, and the sleeves ended up with big bulbous bat-like underarms… NOT a good look. 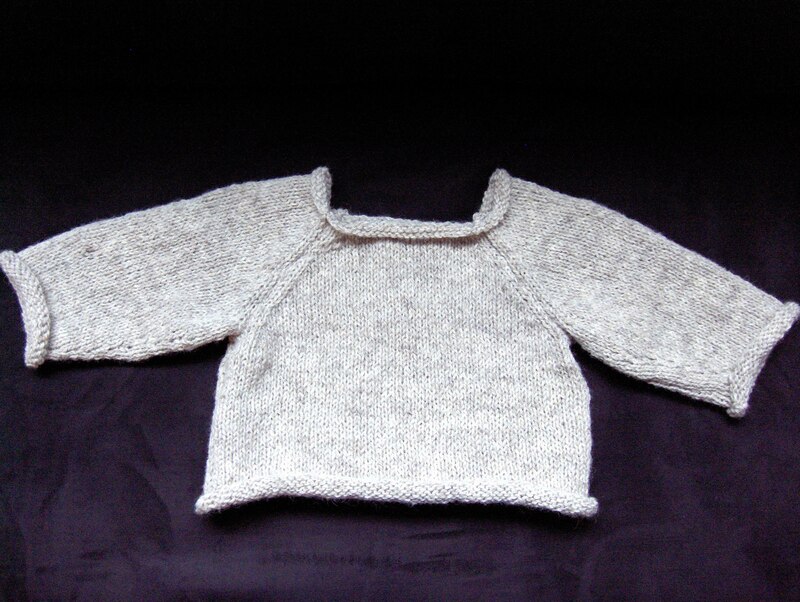 And when I say I started really knitting… well, I do just mean dabbling in baby clothes. Knitting for a newborn is encouraging as even a total slowpoke like me can pull something together in a few weeks if they really try. It was lovely to have Kazuo in a few things I had made myself last winter – and he has been really lucky that my mother, her friends, my aunt and my sister have all click-clacked away on his behalf too… so no chance of him getting cold! This winter I even had stashed away a cardy that grew as I knitted it (though think it will have to wait for next winter actually) and he even still fits a couple of the 3 – 6 mth jerseys and hats I made. But I was determined to eek out a few rows here and there so that he would have something new this winter from me. And here it is, finally! I sewed it together today as he napped and he wore it out when we went to the Schlafly Bottleworks for a tasty lunch. It’s a roomy pattern, so I am hoping for some winter wear next year too and the wool is 100% natural NZ wool… sourced by my Mother, from a charity shop in her town. Yayy for freegan knitting! My knitting at night causes a bit of concern for Akira, a film buff who (understandably, but don’t tell him I said that) finds my noisy hobby a little distracting. But tonight I was so exhilarated by FINALLY completing this project that I just had to skein up some glorious blue wool our friend Dave’s fiancee Julia sent me in October… and start knitting a hat for the wee guy. I don’t know when I will get it done, but it is actually kinda fun to have something ongoing on the needles, and I seem to have found my (somewhat slow) knitting mojo again now it is cold. So I was grateful that Akira found us something to watch (This is England – grim… but compelling) that meant I could make a start. Something to do on quiet moments (???) on the plane.